I love finding quick, delicious, impressive snacks to make on a whim. It can be dangerous, sure, to have an arsenal of last minute recipes from which to choose whenever the mood strikes you for a salty or sweet treat. But, you'll never regret having those favorites when you recieve an impromptu invitation to dinner at a friend's abode. I've got quite a few on the 'sweet' side of the list, but the salty side was lacking until I found these spicy cheese straws over at Smitten Kitchen. I've made them twice in the two weeks since seeking out the recipe for an editorial assignment, and have no doubt they'll make an appearance many more times in the coming weeks. I even discovered that the dough makes an excellent cracker, especially when paired with sweet/tart apples and a little bubbly champagne. And maybe a little Harry Potter and the Sorcerer's Stone with a girlfriend on a Monday evening. Hey, who said Mondays had to be dreary? These fiery cheese straws/crackers will certainly help to spice things up. Har-de-har. In a food processor, combine the cheese, butter, flour, salt, and pepper, pulsing until the mixture resembles coarse crumbs. Add the milk and process until the dough forms a ball. On a lightly floured surface, roll the dough to an 8x10 rectangle about 1/8-inch thick. Cut the dough into 1/4-inch wide strips, or 1-inch crackers. (I used a pizza cutter and a pastry cutter to make easy work of this.) Gently transfer the strips or crackers to an ungreased cookie sheet, spacing 1/4-inch apart. You can twist the straws as I did, if you like. Bake the straws/crackers in the middle rack of the oven...about 12 minutes for the straws and 15-18 for the crackers, until they turn golden brown. Remove from oven and transfer to cooling rack. It may seem odd to be posting a recipe for empanadas in the dead of Winter. To me empanadas are a Summer food, or maybe Fall; plucked up from a street vendor or taco stand, wrapped in waxed paper, eaten as you walk an outdoor festival or Charlottesville’s downtown pedestrian mall. They are perfect on-the-go, warm weather, sandals and short sleeves food; self-contained pockets of goodness you can eat as you walk. Outside. In the sunshine. So why, then, am I sharing these with you in the gray and bitter cold of January? Well, for one, I am long overdue in posting this recipe on Bella Eats. Had I uploaded the images of empanadas just after making them, at the beginning of October, when butternut squash was just starting its weekly appearance on our menu, there would still be Fall festivals and backyard BBQs to attend. I wavered with whether or not to even publish this one, thinking that I’d lost its window of opportunity along with that of a handful of apple dishes I’d prepared, until I received an email from a friend on Saturday. She and her husband were on their way to Bali. Bali! In January! How lovely. Shortly after reading that email I watched Eat, Pray, Love (which, it turns out, is not nearly as good as the book) and stared longingly at the beaches and bike riding and sundresses of Indonesia, the warmth of it all seeping from the screen. That is what I crave this time of year, the ability to escape to someplace warm and tropical, if even for just one meal. If you’re at all similar to me then a dish like these empanadas, which are made up of Winter-ish ingredients but convey the spirit of warmer times, will be just what you’re looking for this January. Unless, of course, your resolutions for the new year include limiting luxuries like butter in your diet. To that I say, “everything in moderation” and “invite some friends over”! These rich, savory, chock-full-of-butter pockets certainly are not something to have on hand for multiple days at a time, and so are really the perfect thing to make and experiment with when you have plans to eat with a group of people. 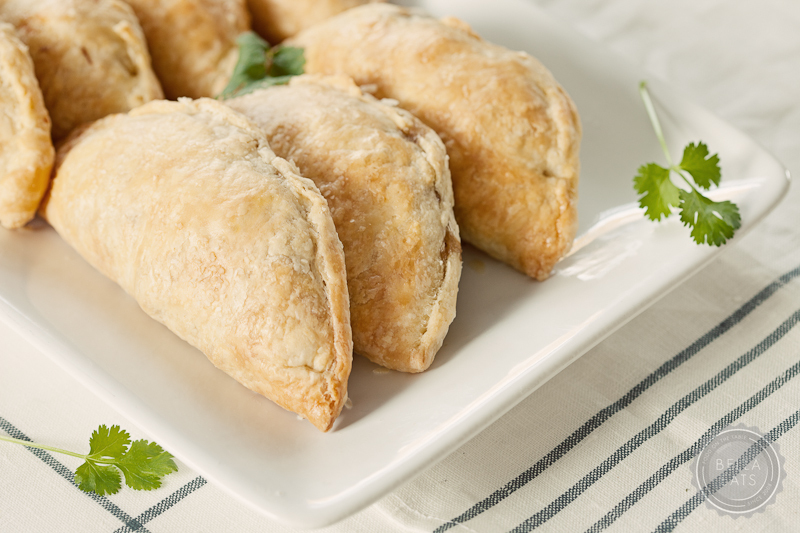 Just as empanadas are an excellent walking food, they also work well at a mostly-standing, “lose the Winter blahs with tequila in one hand” party. I have a feeling that we will all be looking to add one of those gatherings to our calendars towards the end of this gray and dreary month, so keeping this recipe close will be handy. Trust me. Butternut squash roasted with mushrooms and wrapped in a delicate, butter-full pastry has all the makings for a hearty Fall-Winter meal. The fresh tomatillo sauce, however, does throw me off. In a space where I try to share mostly seasonal recipes, anything that calls for tomatillos in the heart of January seems a bit hypocritical, does it not? Luckily, there are some good options for jarred tomatillo salsa out there, any of which would be an excellent (and much less time-intensive) addition to the empanadas. I would, however, keep this sauce in mind next Summer when tomatillos are available, and think about making and putting some away for the Fall and Winter months ahead. First, make empanada dough. Sift flour and salt together in a large bowl. Blend in butter with your fingertips or with a pastry blender until mixture resembles course meal with some (roughly pea-size) butter lumps. Beat together egg, water, and vinegar in a small bowl with a fork. Add to flour mixture, stirring with fork until just incorporated (the mixture should look shaggy). Turn out mixture onto a lightly floured surface and gather together, then knead gently with heel of your hand once or twice, just enough to bring dough together. Form dough into a flat rectangle and chill, wrapped in plastic wrap, at least one hour. Next, make filling. Preheat oven to 400˚. 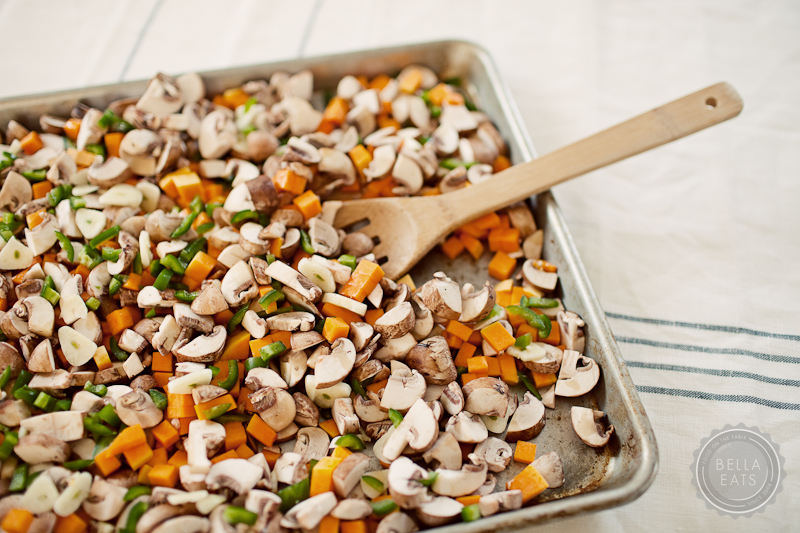 Combine together the squash, onion, garlic, jalepeño, and mushrooms. Toss with olive oil and a good sprinkling of salt and pepper, and spread in an even layer on a baking sheet. (The Gourmet recipe differs here, boiling and sauteing the vegetables. I love the flavor that is brought forth with roasting, so chose to cook the filling using this method instead.) Roast for 25-35 minutes, until the squash is tender and the mushrooms have released their liquid, stirring every 10 minutes or so. Remove from oven and cool in pan on rack. Meanwhile, make the sauce. Heat dry, non-stick pan over moderately high heat until hot, then toast unpeeled garlic until lightly blackened, 2 to 3 minutes on each side. Cool garlic and peel. Simmer tomatillos, onion, garlic, chile, water, and salt in a large saucepan, covered, until tomatillos are very tender, about 20 minutes, and cool slightly. Puree sauce in a blender (or with an immersion blender) until smooth (use caution as liquid is VERY hot). Return sauce to pan and season with salt. Finally, assemble the empanadas! Keep the oven heated to 400˚. Divide dough into 12 equal pieces and form each into a disk (you will only need 8 of these pieces, the rest can be stored in the freezer for up to 1 month). On a floured surface, roll out one disk into a 6 to 7 inch round. Spoon about 1/3 cup of filling onto center and brush edge of pastry with egg wash. 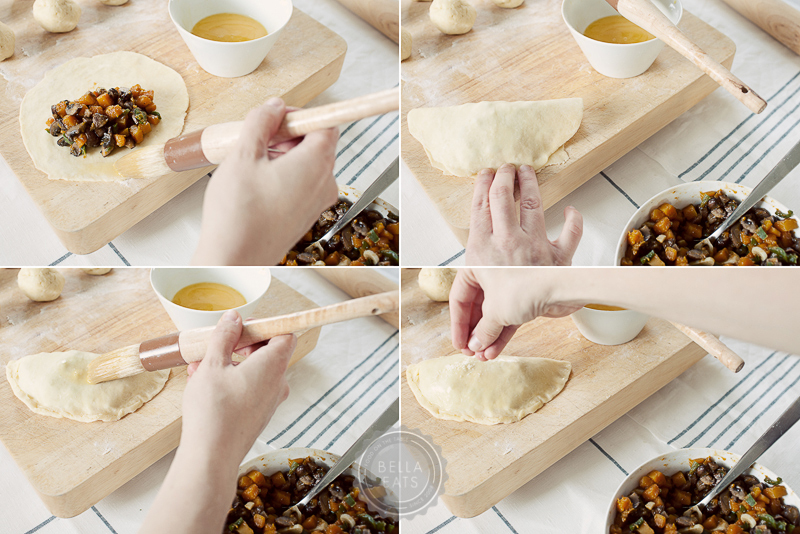 Fold dough in half to form a half-moon, enclosing filling, and press edges together to seal. Crimp edge decoratively and move empañada to a large baking sheet. Make 6 more empañadas using the same method. Lightly brush empanadas with remaining egg wash and sprinkle tops with coarse sea salt. Bake on middle rack of oven until golden, 25-30 minutes. While empanadas are baking, reheat sauce. Cut each empanada in half when slightly cooled, and drizzle about 3 tablespoons of sauce around them. The sauce will keep for about a week in an airtight container in the refrigerator, and is wonderful as a salsa or drizzled over burritos, fish, or chicken.